Late-night snacks and caffeine-powered drinks are often our closest companions while we're typing away at our computers: They fuel the ideas and thoughts that we input one keystroke at a time. But if you don’t stop to examine your keyboard every once in a while, you might miss the fact that it has become covered with crumbs, grease, and sticky soda stains (not to mention a coating of dust). And that’s not all: A recent study showed that some sample keyboards had more bacteria and filth than a toilet seat! When it’s time to sanitize your keyboard and evict that nasty grime and bacteria, don't fret--you can remove all of it effectively in just a few steps. Shut down your computer. If you’re using a wired desktop keyboard, unplug it. Tilt the keyboard upside down and shake it to remove any loose debris. If you have a can of compressed air, you can spray it in between the keys as well. If you’re using a wired desktop keyboard, plug it back in. With such periodic cleaning, your keyboard will stay relatively germ-free and appear brand-new. 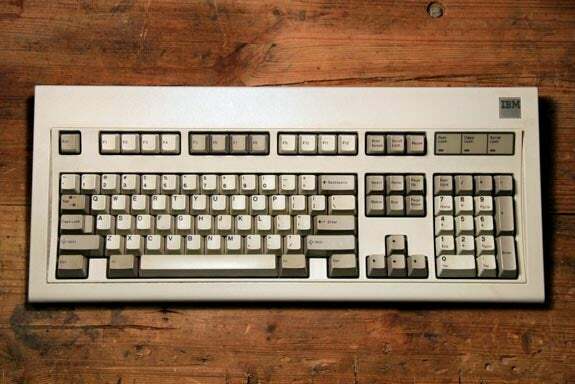 But if your keyboard looks more like a hazardous-waste zone, you can do a more thorough industrial-strength cleaning. Most desktop keyboard letter keys are designed to allow you to remove them with a blunt tool such as a butter knife or flathead screwdriver. Simply place the tool under a corner of a key, and pry it off. If you’re unsure of your particular model, or if you are using a laptop, consult your device's manufacturer to learn whether key removal is supported, so that you avoid damaging your keyboard. Once you've removed the letter keys, you can wash them individually with water and soap, or alcohol, to remove dirt. After washing, dry the keys, and then place them on a towel to continue drying. With most of the keys removed, you should have better access to the area underneath. Thoroughly blow out this area with compressed air, or even a gentle vacuum. Dip a cloth or towelette into isopropyl alcohol, and wipe it along the inner surfaces. As soon as the keys are totally dry, pop them back into place. Each key should snap back on with a small amount of pressure. If you forget where each key goes, consult a keyboard map. Give everything one last wipe with a dry, lint-free cloth. Afterward, be sure to turn on your computer and test your pristine keys--but preferably without a snack in hand (at least for a little while).